Hemming, North Texas ghost town. Detailed driving instructions not available. 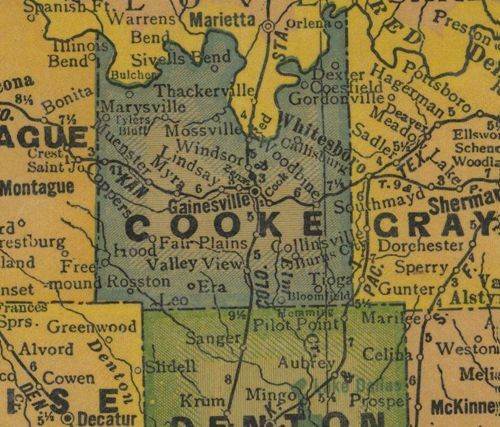 Hemming was named in 1890 to honor Gainesville banker C. C. Hemming who donated land for the fledgling community's first school. 1894 was a landmark year for Hemming with the establishment of a store / post office and a cotton gin. After 1905 mail was rerouted from Pilot Point and the post office closed. Two additional stores were opened between 1900 and 1905. At its zenith, Hemming's population was 125 - a healthy figure for the times. Hemming became the cotton-processing center for its region and it reportedly shipped between 1,000 to 1,500 bales annually. In 1907 a tornado hit Hemming, killing seven and demolishing nearly the entire town. An attempt was made to rebuild, but the damage was too severe. The gin closed in the early 20s and in 1929 the school consolidated with other small schools. Material from the Hemming school was recycled into a Union Grove School District building. Hemming was reduced to only a church and a few residences by the mid-1930s. After WWII the population was reportedly reduced to ten. 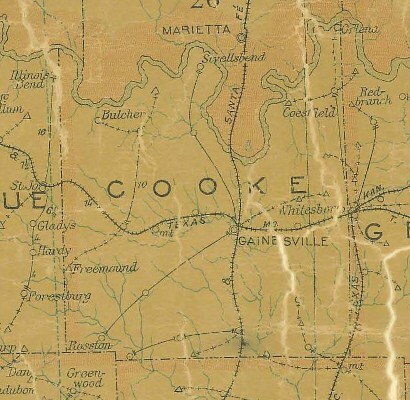 It suffered the cruelest blow any small town can receive when it was removed from county maps in the 1980s.